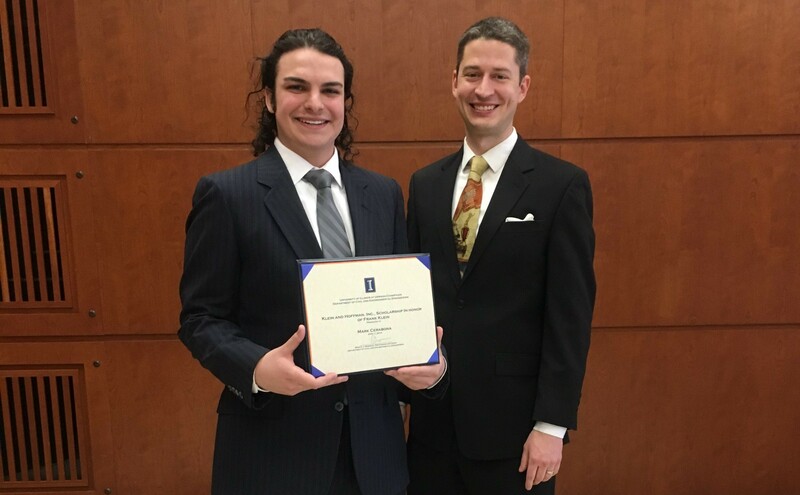 Mark Cerabona, a sophomore studying Civil Engineering, was chosen as the recipient of the Frank Klein Scholarship at the University of Illinois at Urbana-Champaign (UIUC) Civil Engineering Awards (Civil and Environmental Engineering (CEE) at the University of Illinois) Convocation. Klein & Hoffman Senior Associate and Structural Engineer, Bill Ipema, presented the award. Each year, the department recognizes UIUC’s outstanding engineering students for their achievement in academics as well as a number of attributes that contribute to professional success. The Frank Klein Scholarship was established in 1997 in honor of Frank Klein, founder of Frank Klein & Co. (now known as Klein & Hoffman, Inc.), to award the accomplishments of academic merit. Mr. Klein earned his bachelor’s degree in architectural engineering in 1940 and received his master’s degree in civil engineering in 1949, from UIUC. Klein was active in the Illinois Section of American Society of Civil Engineers, serving as President in 1964 and received several awards including Chicago Civil Engineer of the Year in 1982; the Structural Division’s Lifetime Achievement Award in 1992; and, the CEEAA Distinguished Alumnus Award in 1990.